The funeral of Dolours Price on Monday was a seminal event for Irish republicans as they paid their last respects to an IRA heroine. The family had requested a private family funeral, and those wishes were respected. 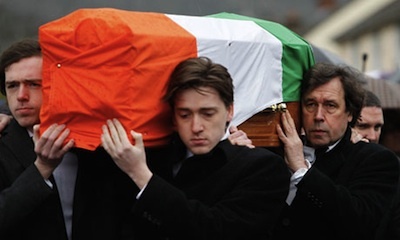 Despite this, up to a thousand people gathered on the Anderstonstown Road, Belfast, as the funeral cortege made its way through driving rain to Milltown cemetery, her coffin draped in the Irish tricolour. Senior republicans and nationalists of all hues were in attendance, including former MP Bernadette McAliskey, Patron of Republican Sinn Féin Ruairi O Bradaigh, and éirígí general secretary Breandan MacCionnaith. Black flags had been erected on lampposts across west Belfast in a final tribute. Sinn Féin president Gerry Adams symphatised with the Price-Rea family but did not attend the funeral, following his public disagreements with the Price sisters in recent years. “For her sons Oscar and Danny there is nothing worse than losing your mother so his sisters, her brother, friends I want to also extend condolences,” he said. Sinn Féin’s West Belfast MP Paul Maskey and the party’s junior minister Jennifer McCann were among the crowds who lined the Andersonstown Road, along with former publicity director Danny Morrison, but did not attend the service. Mgr Raymond Murray, chaplain for 19 years at Armagh women’s prison where the Price sisters were repatriated after more than 200 days on hunger strike in England during which they were force fed, said Dolours “had been ill for years”. In his homily, Father Murray told mourners that Price and her sister were like bosom twins. He said: “Dolours’ family can relate her nature and her talent, both of which is outside the knowledge and understanding of those who did not know her personally. “She was clever and witty, full of fun and held people enthralled by her conversation. “She was very devoted to her parents. Her mother, Chrissie, died on February 1, 1975. “Their mother never saw Dolours or Marian back in Ireland. They did not get compassionate leave from prison in England to attend her funeral. That grief of being unable to mourn was revisited on the Price family when Marian was refused permission to attend the funeral last Friday. That decision provoked a furious reaction among republicans, particularly in west Belfast where the memories of the Price sisters’ suffering on hunger strike is still fresh. But a titanic battle against the extraordinary cruelty of the Parole Commission ensured that Marian was allowed the small compromise of attending her sister’s wake for three hours. Ruairi O Bradaigh, who attended the funeral, expressed sympathy to her sisters Marian and Clare and to her two sons, Danny and Oscar. The former RSF President said the untimely passing of Dolours Price was “a moment in Republican history”, and paid tribute to her life of struggle on behalf of the republican cause. In recent years, he said Dolours had opposed “deceit, hypocrisy and public lying in high places” and “exposed it relentlessly”. He said he had rejected what she saw as a surrender process from the outset. “She saw all that as a contradiction to the mountain of sacrifice that had been made over the decades. She herself had contributed more than her share and she was outraged at the developments,” he added. The post-traumatic stress disorder which Dolours suffered from after decades of IRA actions, including the extended, brutal force-feeding she endured at the hands of English prison guards, were referred to at her graveside. But Socialist Eamonn McCann said Dolours was soft-hearted at her core. “Sometimes in war atrocious things are done; sometimes hard things have to be done,” he said. Civil rights activist Bernadette McAliskey spoke of the hardship which many had suffered through the conflict. She said: “We cannot keep pretending that 40 years of cruel war, of loss, of sacrifice, of prison, of inhumanity, has not affected each and every one of us in heart and soul and spirit. At a prior event, she said that the British state had “hounded” both Dolours and Marian Price, and pointed to the extraordinary efforts made by the Six-County Minister for Justice David Ford to prevent Marian’s release for her sister’s funeral. “Power still lies in the fist of the Northern Ireland Secretary of State. But they have paper power,” she said. “Marian Price remains in prison on the whim of the Secretary of State.